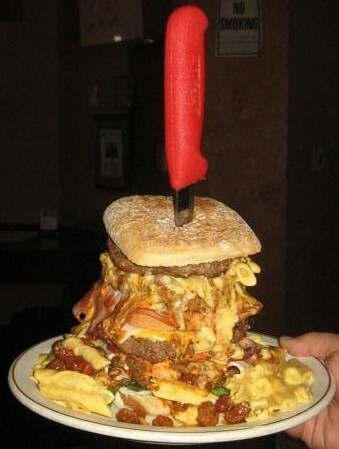 The “Fat Daddy Heart Attack” Challenge Burger. Armed with a hearty appetite and the will to put his name on the wall versus the 4 1/2 pound monster plate of food and the 25 minute time limit, Bydo gave it all he had. It seemed as though all the activity in the restaurant stopped as the theme from “Rocky” was pumped out through the speakers and the mammoth plates of food were brought out from the kitchen. First, a family size order of fries. Then the burger… four 7 oz patties, deli turkey, deli ham, 3 buns, lettuce, tomato, onions, with a roasted pepper-mayo sauce. If that was not enough, add in some chili and mac’n cheese. A small, curious crowd gathered as Joe Martini went over the rules, and Bydo stared down his opponent. It was reminiscent of the moments preceding a championship fight. Are you ready to take the challenge? Steven was. He had his strategy. He had his appetite. He had, “the eye of the tiger”! It was on! Bydo stares down his opponent. spectators grew, a few shouts of encouragement and words of advice could be heard. He is a hometown boy and had the crowd on his side. He looked to be in decent shape half way through the bout. 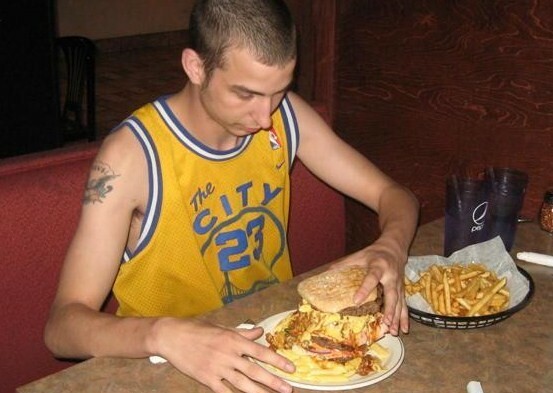 But when it came to the buns and fries, the time limit and amount of food caught up with him. With only seconds left, he waved the white flag, and threw in the towel, conceding defeat. 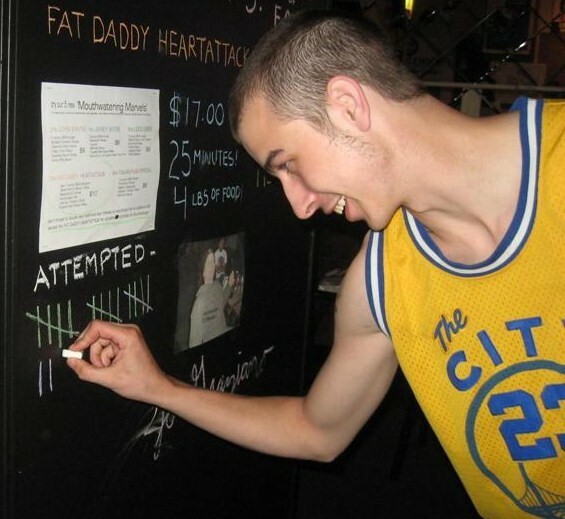 With his pride bruised, but still intact, he picked himself up and in a show of good sportsmanship, he himself, added his tally to the wall with the other 17 victims of this champion burger. Bydo vowed to be back for a rematch. Good luck next time!